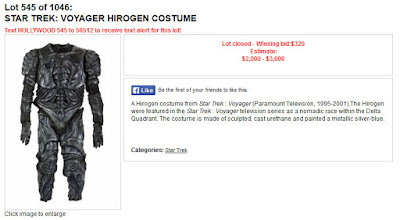 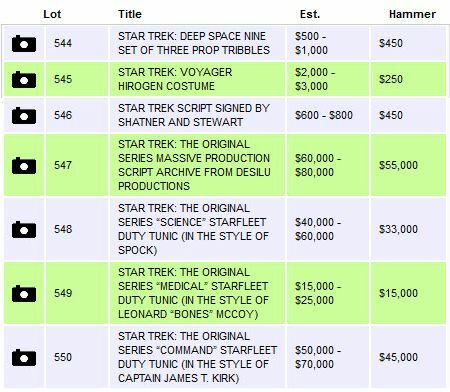 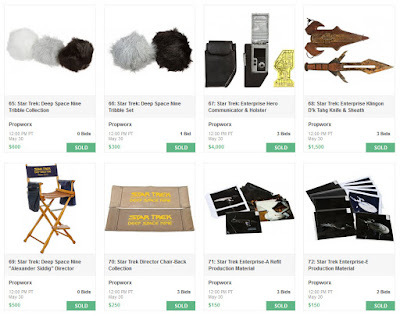 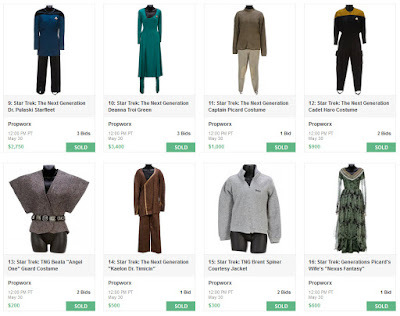 Presented below is the complete set of final prices realized for the 7 lots of Star Trek memorabilia that were offered in the Julien's Hollywood Legends 2015 Auction; which concluded today in a live online bidding session at julienslive.com. 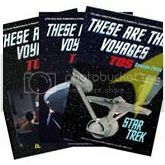 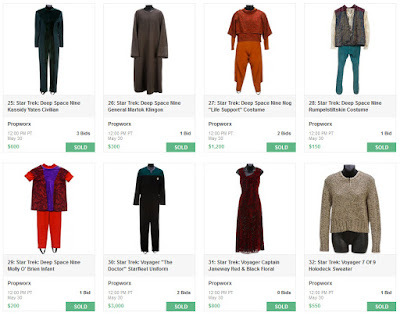 This sale is particularly notable for the presence of 4 extremely rare lots of TOS memorabilia: Lot 547, which consisted of a massive archive of 193 total production script drafts and 94 story outlines; as well as Lots 548 through 550, which were authentic Original Series Spock, McCoy and Kirk Starfleet tunics. 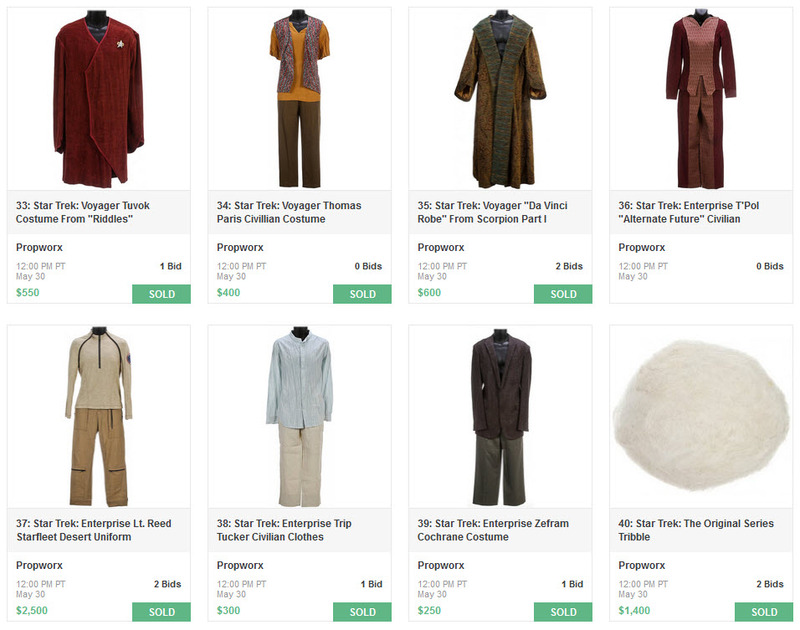 This may be the first time since the incredible December, 1993 William Ware Theiss Estate Auction held by Butterfield & Butterfield that a complete set of TOS tunics for "the big three" was available for purchase in a single sale. 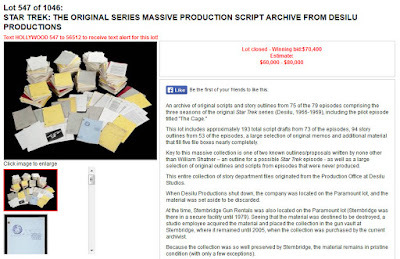 Lot 547, the script archive, realized a final price of $70,400 (which equals a high bid or hammer price of $55,000 plus a 28% buyers premium) and is certainly one of the largest known Original Series production material archives sold at auction to date. 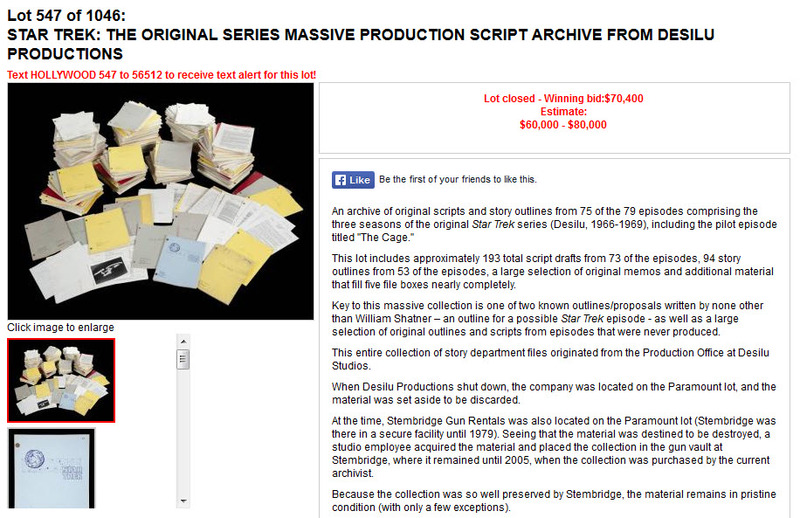 It compares in overall size to the Joan Pearce TOS Archive which consisted of 240 vintage scripts and numerous additional research reports, shooting schedules and story outlines, which sold as Lot 557 in Profiles Hollywood Auction 25 on July 28, 2006 for a final price of $63,250. 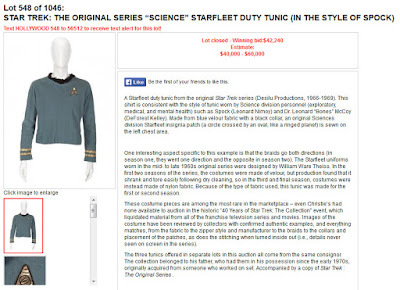 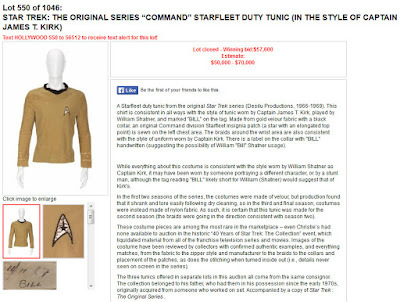 Lot 550 in this sale was a William Shatner screen used Captain Kirk tunic; which realized a final price of $57,600 (on a hammer of just $45,000) - a great price for a screen used TOS Shatner, especially considering that a different Shatner velour piece sold for $98,400 in Profiles Hollywood Auction 49 on July 31, 2012. 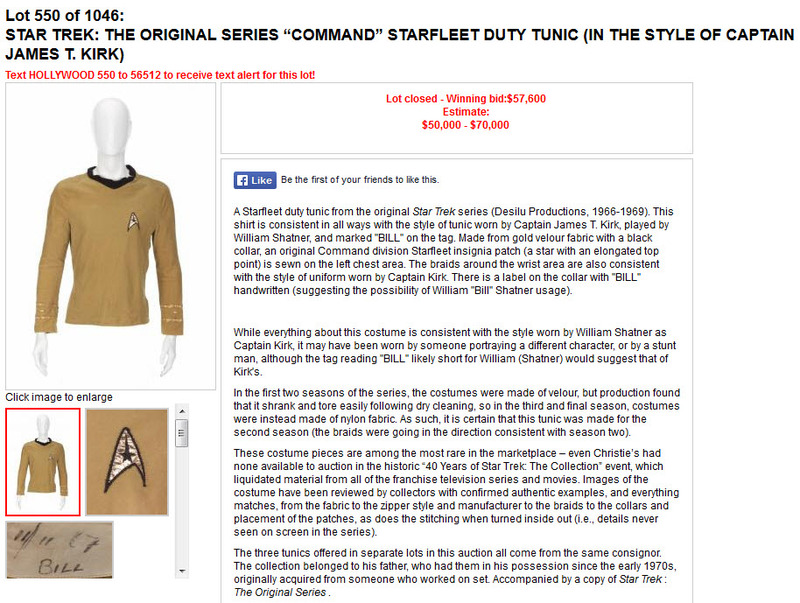 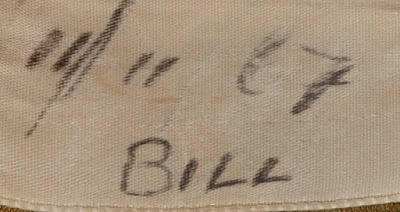 Today's tunic, Lot 550, was unique in that it was the first Original Series screen used costume that I've observed to contain a handwritten date, specifically, 11/11/1967, inscribed on its interior fabric. 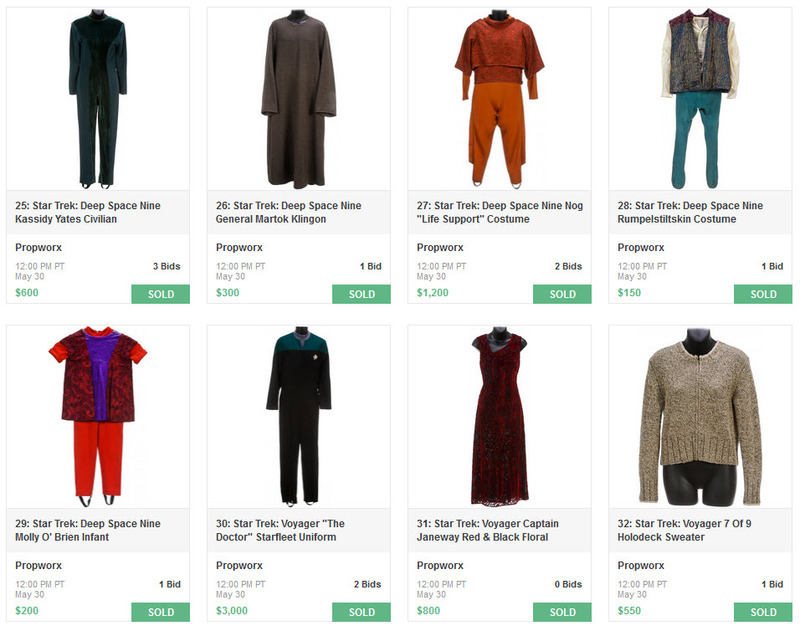 That date is just a couple of days after the 2nd season episode "A Piece of The Action" completed filming on the TOS soundstage; and indeed, this specific costume can be seen worn by William Shatner in the opening scene of this episode, when Kirk is sitting in the Captains Chair on the Enterprise bridge. The braid at the front cuff on Shatner's left arm is an exact screen match to Lot 550. 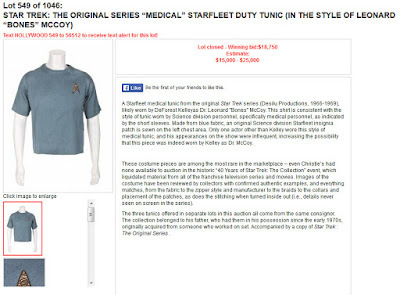 Lot 548, the Spock tunic, likely worn by Leonard Nimoy, sold for $42,240 (on a hammer of $33,000) and Lot 549, the McCoy short sleeved medical tunic, likely worn by DeForest Kelley, sold for $18,750 (on a hammer of $15,000). 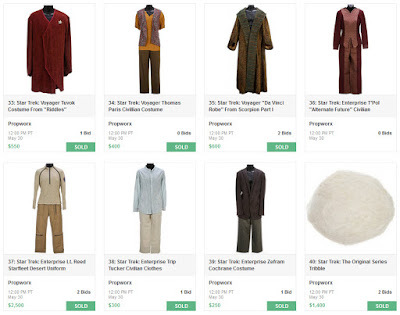 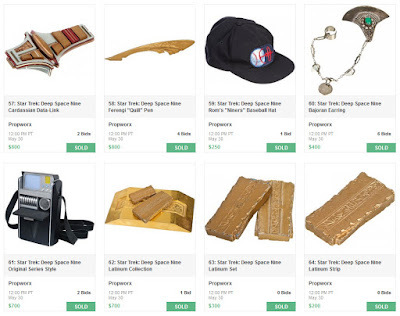 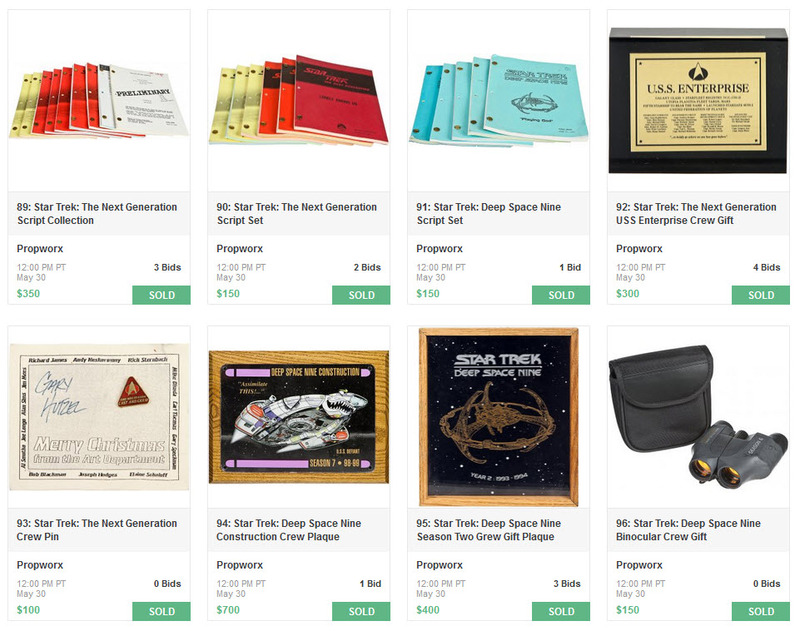 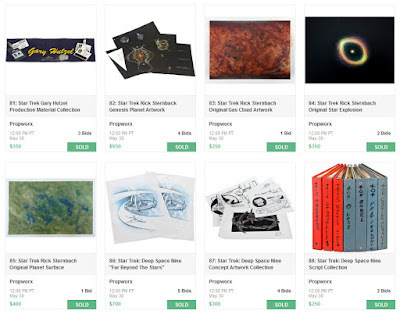 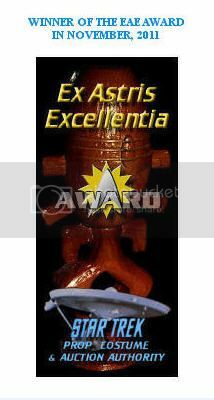 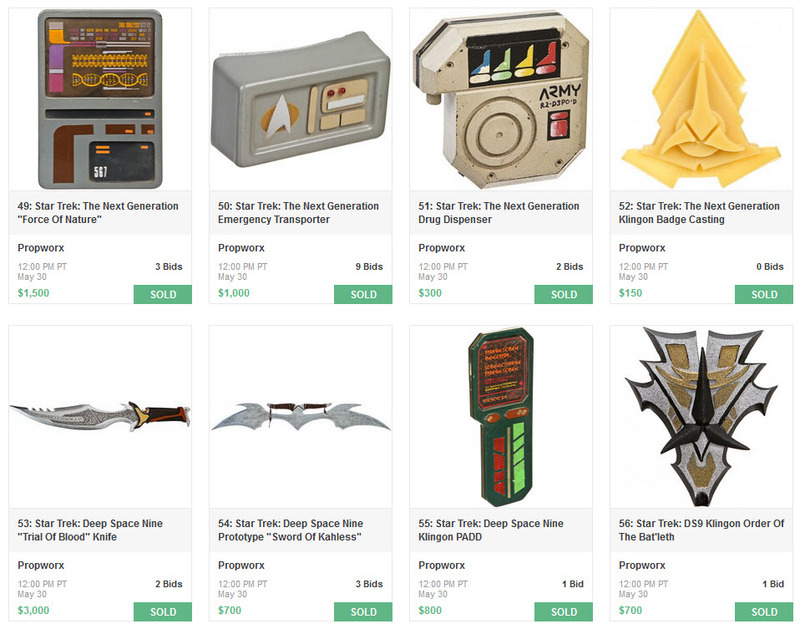 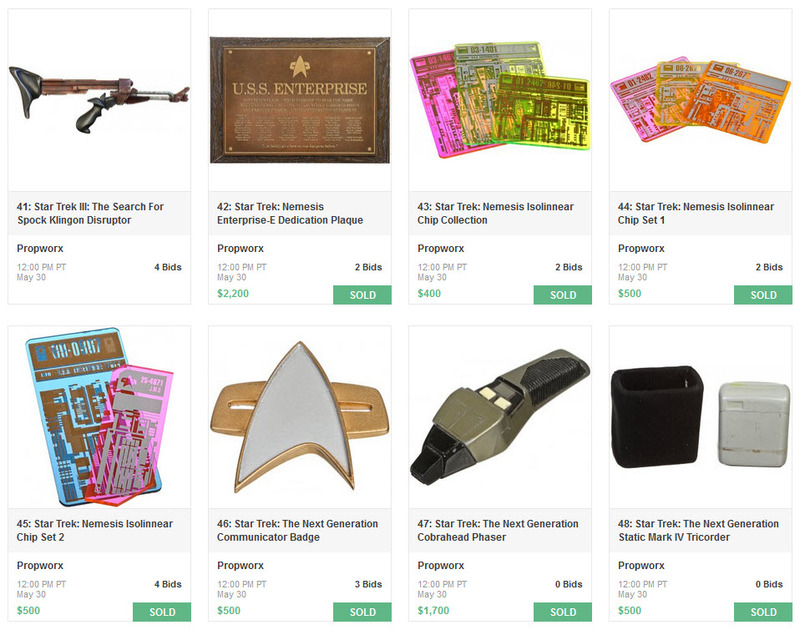 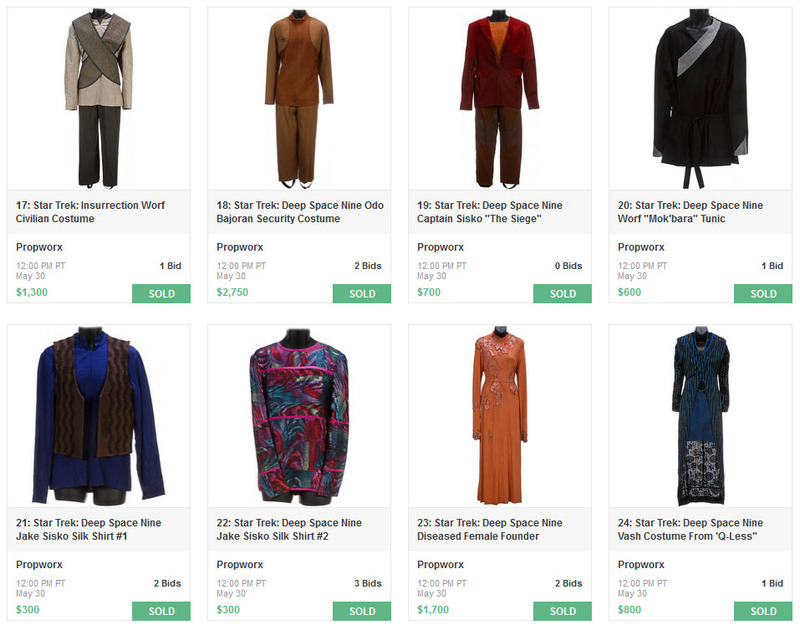 Presented below is the complete set of final prices realized for the 100 lots of Star Trek memorabilia that were offered in the Propworx Star Trek Auction V event; which concluded on Saturday May 30th in a live online bidding session at LiveAuctioneers.com. 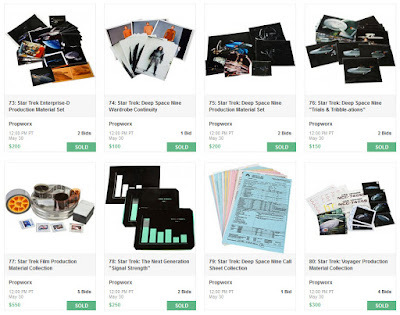 Not entirely unexpected was the fact that the highest prices realized in this auction were associated with the group of Starship filming miniatures that were offered as the opening lots of the sale. 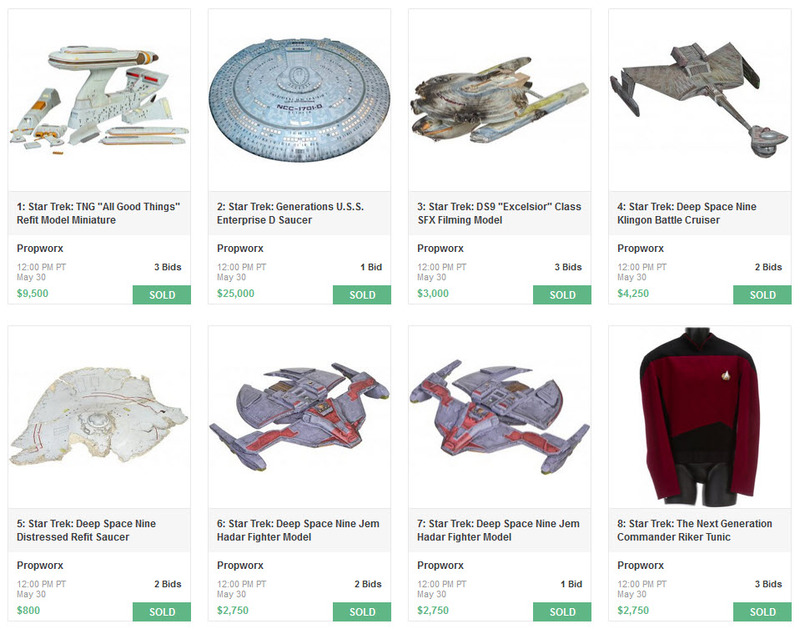 Specifically, Lot 2 - the 12 foot Enterprise D Saucer section model from Star Trek: Generations realized a final price of $29,500 (including an 18% buyers premium); Lot 1 - the Enterprise D Third Nacelle Refit model from the TNG finale "All Good Things" sold for $11,210 with premium; and Lot 4 - a Star Trek DS9 Klingon Battlecruiser went for $5,015 with premium.